Are you Making this Beauty Mistake with your Bronzer and Blush? Blush and bronzer don't have to be complicated or intimidating. All too often, we hear women say they want some colour or a glow, but have no idea how to apply it, and end up looking overly flushed or like an amateur clown. Want to know how to pick the best shade of blush or bronzer for your skin tone and how to apply it? Kristy, a qualified makeup artist and Kiana Beauty's BECCA expert, shares her simple tips on achieving a healthy flush or glow. BECCA Mineral Blush in Wild Honey (top) and Flowerchild and BECCA Sunlit Bronzer in Bronzed Bondi (left) and Ipanema Sun (right) pictured with BECCA Ombre Rouge Eye Palette. Kristy, what are the most common mistakes you see when it comes to blush and bronzer? Generally, I see women wearing the wrong shade for their complexion or applying it in the wrong position on the cheek, kind of like a blush/bronzer hybrid. When should I use blush and when should I use bronzer? Consider what it is you are trying to achieve. Want to add a subtle flush of colour to the cheeks? Blush is perfect for creating naturally rosy cheeks. Want to create a lit-from-within look? Then you need bronzer. It will add some warmth to your face without adding any colour. Help! How do I choose the right shade of blush and where should I apply it? The right shade depends on your skin tone. Fair/very fair skin generally has a pink undertone. BECCA Mineral Blush in Flowerchild is the perfect shade to add some luminosity and a natural-looking flush to fair skin. Neutral skin BECCA Mineral Blush in Wild Honey is universally flattering on neutral skin. ﻿Dark skin or skin that tans easily﻿ should generally avoid pink-based blush and opt for peach-based shades instead. You can achieve a beautiful, healthy pinch of colour with BECCA Mineral Blush in Songbird. When applying blush, it should be kept to the apples of the cheeks to mimic where the blood naturally pools in your cheeks. This will give you a natural flush of colour. To find the apples of your cheeks, smile. The parts that pop up are the apples of your cheeks. Notice where your laugh lines are. The colour needs to stop just before here, so that the blush doesn't go across your laugh lines. Apply the blush in a circular buffing motion using the corner of the BECCA The One Perfecting Brush. Start off slowly and build up the colour to your heart's desire. I want to give my skin a healthy glow, without adding colour. What do I do? Bronzer is the perfect way to add warmth to your skin to achieve a sun-kissed, just-got-back-from-holidays glow. Keep your bronzer looking natural by selecting a shade that is one to two shades darker than your skin tone. 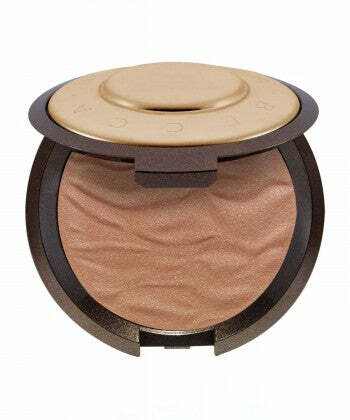 Light to medium skin tones look best with BECCA Sunlit Bronzer in Bronzed Bondi. Medium to dark skin will look like a goddess with BECCA Sunlit Bronzer Ipanema Sun. When using bronzer, it needs to be applied on the cheek bones and anywhere else where the sun naturally kisses - a light dusting along the bridge of the nose and the outer corners of the forehead and temples. Use the BECCA The One Perfecting Brush to apply your bronzer, and make sure you blend and buff well to avoid any obvious stripes on your cheeks. So there you have it. An easy way to create flushed cheeks without having to break into a run, or a healthy holiday glow minus the sun. If you'd like some personalised advice on the best BECCA products for your skin, feel free to contact Kristy, our BECCA expert via our Ask an Expert feature. Did you know that you can now buy your favourite BECCA Cosmetics products using Afterpay from Kiana Beauty ? All orders from Kiana Beauty are lovingly wrapped in our free signature giftwrap and we proudly offer free standard shipping within Australia on all orders over $50. Our Kiana Beauty Melbourne team is thrilled to announce that we are now stocking BECCA Cosmetics! BECCA Cosmetics is an Australian beauty brand, founded by Rebecca Morrice Williams. Rebecca, a makeup artist from Perth, was inspired to create her own line of makeup when she became frustrated at being unable to find the perfect foundation. My search for the ‘perfect foundation’ became a mission that was to prove as elusive as the search for the Holy Grail! BECCA's philosophy is all about creating a flawless, effortless look. The range of products is carefully curated to suit all skin types and skin tones, so that natural beauty is revealed, rather than covered up. BECCA invests time and effort into creating lightweight, luxurious and advanced formulas that do the heavy lifting behind the scenes - yet are easy to use, and leave your skin looking its gorgeously natural best. Emily, one of our beauty experts, shares her favourite BECCA products with us. This palette of five eyeshadows suit all skin tones, and can even multitask as a highlighter, eyebrow powder, or eyeliner. I've actually worn this everyday since we got it in, and it's the first palette I've bought where I love every single shade inside. This makes skin look so healthy! My skin has a yellow undertone, so the slight violet in this helps to beautifully balance and brighten my skin. It makes me look fresh and more awake, even when I've had a late night. This primer is heavy duty. I've been using it in my makeup kit for years, as it's like liquid blotting paper. It takes a bit of time to apply as it's best to pat it on, but it is the best oil control product I have ever tried. An amazing product for skin with excess oil and too much shine. This is another must-have in my makeup kit as it absolutely makes skin glow! I really dislike chunky luminisers, but this one is created from ultrafine, light-reflecting pearls, so doesn't feel heavy. It is fantastic for photos as it picks up the light beautifully on camera. I adore all five shades, but if I had to choose, my favourite would be Opal. Reveal your natural beauty rather than cover it up with BECCA's entire makeup range. Suitable for all skin types and skin tones, BECCA Cosmetics helps your pursuit of creating a flawless, effortless look. You can view Emily's favourite products plus our entire range of BECCA Cosmetics here. Don't forget about our free standard shipping within Australia for orders over $50. We are also excited to offer Afterpay at Kiana Beauty. Have you got a question for Emily or one of our other beauty experts? Simply Ask an Expert or send us an email to hello@kianabeauty.com.au, and we'll get back to you.